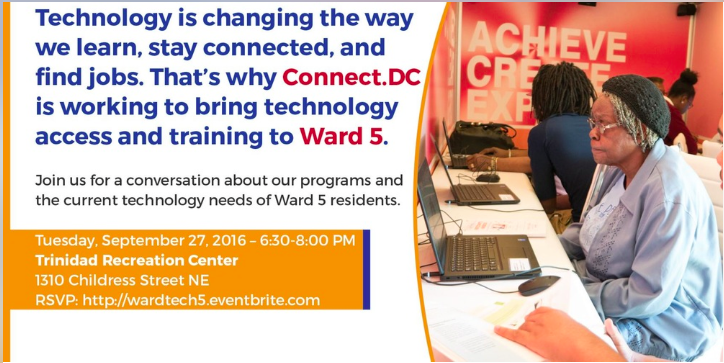 TNA will be joining with Connect.DC next Tuesday, September 27th for a conversation on technology needs and programs for Ward 5 residents. We will still be meeting at the Trinidad Recreation Center but the meeting will start at 6:30 pm (instead of the usual 7:00 pm start time). We look forward to seeing you there and learning more about the Connected Communities Initiative and how we can increase internet access for residents, businesses and community institutions in our neighborhood. There is an Event Brite link where you can register (Yes, we know that assumes internet access when we are going to a meeting on increasing access where it is limited. If you cannot access the link, please show up anyway!). The Ward 5 Community Happy Hour helped support our fundraiser for youth last year. They meet every month and the next one is close to Trinidad. Details are below for anyone that may wish to attend. Right off the red line at NOMA, it’s easy to get to Union Social via metro, Capital Bike Share, bus or even on foot. Driving? They’ve got 2 hours of validated parking in the garage attached to the adjoining apartment building. The District has 13 Councilmembers, one per Ward and five at large, elected to serve as the legislative body of the District government. The Council of the District of Columbia also provides oversight of the agencies, commissions, and other government bodies. Want to learn more? See the meeting notice below from Chairman Phil Mendelson’s office for an opportunity to meet the Chairman of the Council, speak up for Trinidad and Ward 5, and ask questions. Chairman Mendelson is inviting you to Ward 5 this Saturday, March 12th from 10:00-11:00 AM at Peregrine Espresso (1309 5th St. NE-Union Market) to answer your questions about all things District! Have any concerns about District government services? An idea to improve your neighborhood? Or just want to say hi to the Chairman of the Council? Then come on by Saturday (3/12) to Peregrine Espresso to Meet up with Mendo! Where’s the Closest Beach? Downtown DC! You might have been hearing about DC’s new and temporary beach. The National Building Museum and a firm called Snarkitecture have teamed up to install a 10,000 sq ft artificial ocean with 750,000 translucent balls. The beach comes with chairs, paddleball, a snack bar, and a vast ball pit but sunscreen is not required. While there is a fee for entry, the NBM is holding Ward Days at the Beach with free entry for residents. The Ward 5 Day at the Beach is on August 11th from 9 am to 11 am. Wards are determined by zip code so you need to take a valid form of identification to benefit from the free entry on August 11th. Check in at the admissions desk for a wristband to permit free entry.